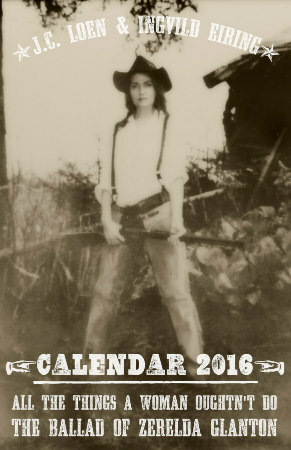 Greet the new year in true cowgrrrl fashion with the Zerelda Glanton Calendar 2016. The calendar features fourteen images (the twelve months + front and back) from the polaroid photobook All the Things a Woman Oughtn’t Do – The Ballad of Zerelda Glanton. Choose between a variety of holidays to best suit your culture. Get your calendar here. Safe filter must be turned off to view it – calendar contains images where clothing is not entirely present. This entry was tagged "old west", bandit, calendar, cowboy, cowgirl, gunslinger, Ingvild Eiring, outlaw, photobook, photography, Polaroid, wild west, zerelda glanton. Bookmark the permalink.